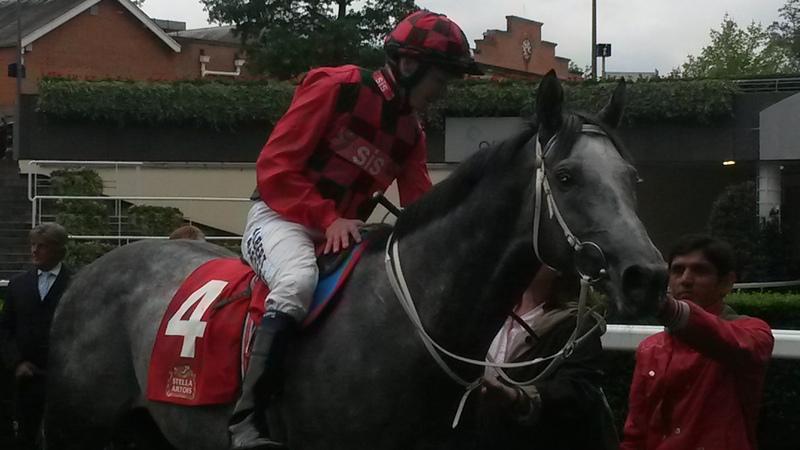 Energia Davos and Jamie Spencer. By Simon Jackson at Ascot. Trainer Jane Chapple-Hyam appears set for a trip back to her native Australia after the success of Energia Davos in the feature Stella Artois Handicap at Ascot today (Friday). The winner was having his first start for Chapple-Hyam who bought the seven-year-old privately from fellow Newmarket trainer Marco Botti in July. Energia Davos’ success provided Jamie Spencer with his third winner of the day when landing the Class 2 one mile contest by a neck from favourite Puissant. Chapple-Hyam owns a small share in the horse whose majority owner after the race indicated a preference for the Emirates Stakes – a Group 1 contest over 2000 metres at Flemington on November 7 – rather than fulfil his entry in the Betfred Cambridgeshire at Newmarket later this month. “He is guaranteed a run in the Cambridgeshire or he could run in the Emirates Stakes at Flemington on the Saturday after the Melbourne Cup and Jamie is in town and so it’s up to the owner,” Chapple-Hyam said. “He would have to do quarantine which starts on September 24 which is a Thursday and the Cambridgeshire is on Saturday the 26th. So we have got to make our mind up on whether we go into quarantine to get on the plane. “I got this fellow off the Botti yard privately. He has been off the track since February,” she added. Spencer’s other winners at Ascot were Richard Of Yorke for Luca Cumani and Taurean Star for Michael Bell who also trains the Melbourne Cup bound Big Orange who earlier this season Spencer rode to win the Goodwood Cup. Bell confirmed at Ascot that Big Orange was set to go into quarantine while revealing that he would not have a prep race in Australia before the Melbourne Cup.